Free Shipping Included! Joseph Ribkoff Black/Beige Tunic Style 173915 by Joseph Ribkoff at Femi Store. MPN: 173915. Hurry! Limited time offer. Offer valid only while supplies last. Style: 173915. Fabric: Knit, Silky Knit. Color: Black/Beige. 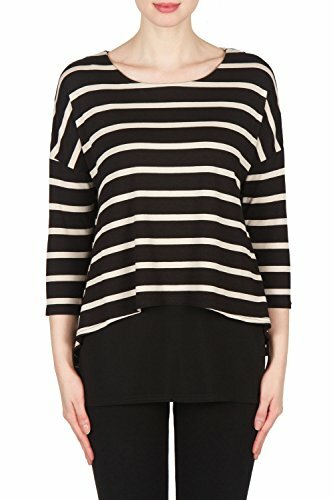 Approximate length (size 12) : 29"
With its two-tone striped upper layer, this double-tiered, poncho-style top from Joseph Ribkoff is both fashionable and easy to wear. The asymmetrical hemline lengthens from side-seam to side-seam. With drop-shoulder, three-quarter sleeves and a rounded neckline.